New York, NY, October 15, 2012 - A new Mid-Atlantic Regional Ocean Research Plan pinpoints priority ocean and coastal research needs for the Mid-Atlantic ocean region to advance coordinated research that promotes economic and environmental sustainability in the region. The ocean and coastal areas of the Mid-Atlantic face a number of challenges from threats such as climate change and habitat degradation, as well as opportunities for economic development from offshore energy, commercial and recreational fisheries, and other sustainable uses of coastal and marine resources. Impacts from climate change, including sea-level rise and extreme weather events, are predicted to increase in the coming years, with significant implications for ocean and coastal areas across the region. These are just a few of the important issues that need to be addressed through science-based ocean ecosystem management. “The Mid-Atlantic Regional Ocean Research Plan is an important step in promoting economic growth and environmental sustainability in the Mid-Atlantic through building an improved understanding of the region’s ocean and coastal areas to support viable regional ocean governance,” said Nancy Targett, director of Delaware Sea Grant and one of the project leads. The four-year project, funded by the National Oceanic and Atmospheric Administration through the Sea Grant Regional Initiative, supports regional and nationwide efforts to inform regional ocean planning in the U.S., especially: The National Ocean Policy (established by Executive Order 13547 in 2010), which calls for an improved scientific understanding of ocean and coastal ecosystems to support regional ecosystem-based ocean planning, and the ocean planning efforts of the Governors of the region through the Mid-Atlantic Regional Council on the Ocean (MARCO). Climate Change – The plan calls for an improved understanding of sea-level rise effects on coastal ecosystems, baseline monitoring to better visualize change, and an improved understanding of hazard risks posed by climate change. Offshore Energy – The plan outlines the need to establish baseline data for environmental impacts, assess the technological feasibility of various energy exploitation approaches, and improve understanding of the socioeconomic impacts of offshore energy. Water Quality and Quantity – Understanding the impacts of nutrient loading and cycling on marine ecosystems, understanding the implications of management decisions, and coordinating water quality monitoring efforts were identified as the top priorities. Ecosystem Structure and Function – The plan calls for studies on the relationship between land-use and ocean ecosystem health, identification of critical habitats in the region, and improved integration and analysis of existing data. Human Dimensions – The plan also addresses social, economic, cultural and political considerations and highlights the need to better understand community vulnerability and resilience to ocean-related changes, governance and policy effectiveness, and main drivers of behavioral change in the region. The state Sea Grant programs in the Mid-Atlantic have a long history of collaboration and coordination on regional-scale priorities. Over the last two years, the Mid-Atlantic Sea Grant programs have jointly responded to emerging regional opportunities and supported regional research on issues such as the human dimension of sea level rise, invasive species research and outreach, outreach on the risk for swimmers posed by rip currents, and have also facilitated a state-federal partnership to map ocean canyon habitats. In support of future regional research, the Mid-Atlantic Sea Grant programs will soon announce new regional funding to address identified regional research priorities in the areas of climate, water resources, and human dimensions. Other opportunities for funding, collaboration and coordination among interested parties in pursuit of the research priorities will be explored. Sea Grant is a nationwide network of 33 university-based programs that work with coastal communities and university networks to foster research, education and training to support environmental stewardship, long-term economic development and responsible use of America’s coastal, ocean and Great Lakes resources. More information on the National Sea Grant Program can be found here: http://www.seagrant.noaa.gov. 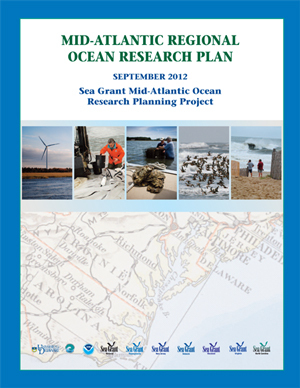 Full details on the Mid-Atlantic Regional Ocean Research Plan, including a literature database, a detailed technical report on identified research needs, stakeholder engagement and information on other regional efforts, can be found at the project Web page: www.midatlanticoceanresearchplan.org.